By CBSNews.com's Amy Sara Clark. Who's running for president? Just about everyone, it seems. With no incumbent, vice president or other presumed front-runner on either side, the 2008 election is the most "open" since the 1920s, drawing in a plethora of strong hopefuls. Most of the attention has focused on possible frontrunners such as former Democratic Sen. John Edwards, Sens. Barack Obama and Hillary Clinton, former Vice President Al Gore and, on the Republican side, Sen. John McCain, Govs. Mitt Romney and George Pataki, and "America's Mayor," Rudolph Giuliani. Former NATO Commander Gen. Wesley Clark, Former Health and Human Services Secretary Tommy Thompson, Sen. Joe Biden, and Reps. Dennis Kucinich and Duncan Hunter are also all either running or considering runs. But lower on the radar are a swirl of other candidates, declared and still deciding, who could give the top-tier a run for its money. And one of them could even win. Just think Bill Clinton in 1992 or Jimmy Carter in 1976. Both began the race polling in the single digits. Here's a look at other candidates worth watching. And you never know, says Democratic pollster Chuck Rund, one of them could "find the right mix of politics and organizational structure and money and a uniqueness and clarity of ideas," that would allow him to climb all the way to the top. Gov. Mike Huckabee of Arkansas comes to the race with three winning assets: he's a governor, a Southerner, and a Baptist minister. "He's a good speaker, a conservative who could appeal to a broad range in his party," says Stuart Rothenberg, editor of the non-partisan Rothenberg Political Report. Plus, Huckabee sides with President Bush on immigration, has mainstream conservative credentials, and, most importantly, holds the state's top office. The last sitting senator to be elected president was John F. Kennedy, 46 years ago. Governors are considered more experienced in holding top leadership positions, appear to be free of Washington influence, and perhaps most importantly, there's no congressional voting record to be scrutinized. But for this election cycle, voters might prefer senators with national and international foreign policy experience. "For a while it didn't matter very much," says Dennis Goldford, a professor of politics at Drake University in Des Moines, Iowa. "But we live in a Sept. 12th world now." Huckabee, 51, has not yet declared, but says he's considering a presidential run. Huckabee has little experience in foreign policy, but his domestic experience is solid, having served 10 years as governor, three as lieutenant governor and as chairman of the National Governors Association. Huckabee has also worked as a Baptist minister. He is married and has three grown children. More importantly, Huckabee has the reputation of being a particularly good governor; Time magazine named him one of the five best governors in 2005. Huckabee is also known for his dedication to physical fitness — both his state's and his own. Dubbed "The Thin Man" by the media, Huckabee dropped from 295 pounds to 185 after learning he had type II diabetes three years ago. In his state, Huckabee has eliminated vending machines from elementary schools and instituted 30-minute daily exercise breaks for state employees. He also co-chairs the national Alliance for a Healthier Generation with Bill Clinton. But Huckabee brings liabilities to a potential candidacy as well. He's drawn criticism for verbal missteps, including jokingly referring to his weight loss as due to "six weeks at a concentration camp" and for calling his state a "banana republic." He has also been cited for five violations by the Arkansas Ethics Commission, all dealing with not reporting gifts or cash. So far, Huckabee is not doing too well in the polls — when he shows up in a national poll at all, he hovers between 1 and 2 percent. Iowa and New Hampshire focus groups last summer said Huckabee was likable but lacked passion, says Steve Hinkson, political director of Luntz Research Companies, which did the study. "It's a serious time and the voters appreciate that. … He's a serious guy but his intensity doesn't necessarily come across." But Huckabee's greatest roadblock will probably not be a lack of passion but money. "I'm not sure if he can raise any money," says Rothenberg. "Nobody knows who he is." Kansas Sen. Sam Brownback is hoping to gain leverage by appealing to the conservative wing of his party, and there's a good chance he'll succeed. Front-runners Giuliani and Pataki support gay and abortion rights. McCain voted against a ban on gay marriage, and although Romney opposes abortion now, he's supported it in the past. "The key is who fills the vacuum?" says Rothenberg. This year, "a big vacuum on the Republican side is for the evangelical social conservatives. ... He's the most plausible candidate from the right." An evangelical Christian who converted to Catholicism, Brownback, 50, is against abortion rights and gay marriage, and, according to his Web site, for "market- and consumer-based solutions to health care reform," and an optional flat tax. He is against judges who "legislate from the bench," and for "protecting American culture." According to a Pew Research Study, 23 percent of Republicans are white evangelical Protestants, 78 percent of which voted for Mr. Bush in 2004. Like Huckabee, Brownback has yet to declare a presidential bid or make a mark in national polls (or even beat 3 percent). He is married with five children, the youngest two adopted; one from China and the other from Guatemala. The Luntz focus groups found Brownback to be "clean-cut, honest, and clear about where he stands," but also saw him as a bit too "soft-spoken" and "passive." As architect of the Contract with America that led the Republicans to take back the House in 1994, Newt Gingrich is the best-known of the second-tier candidates. "He's not a frontrunner," says Republican pollster Linda DiVall, but "given his past stature in the party," and his reputation as someone with big ideas, she says, "he's going to be hard to ignore." A Dec. 5-7 CNN poll had Gingrich at third at 13 percent, right after Giuliani and McCain. Gingrich also did surprisingly well in Luntz's focus groups, says Hinkson, falling near the top of the list. Most telling, participants' approval ratings shot up after they had seen video clips of him speaking. "They thought that he was dead on with some of the challenges America is faces," Hinkson said. "He's got good name recognition, is a good speaker, a lot of Republicans think he's a good motivator," says Rothenberg. But he adds, "I'm sure critics and opponents will raise questions about ethics and things in his public and private life." Gingrich, 66, who is married to his third wife and has two daughters from his first marriage, was elected as a representative from Georgia in 1978. He served as House Speaker from 1995 through 1999, when he resigned his seat under pressure after a poor Republican showing in the midterm elections. In 1997, Gingrich was investigated by the House Ethics Committee. He calls the 84 charges groundless, and they were dismissed, but Gingrich agreed to reimburse the Ethics Committee $300,000 for the cost of the investigation. But Hinkson said that Gingrich's ethical issues didn't seem to bother his focus group participants. "I think that voters don't really remember the Newt of the '90s, don't remember the corruption and malfeasance associated with him. And even when they were reminded, it didn't make much of a dent. There's so much (corruption) now, and it happened so long ago," he said. Plus, says Rund, citing Bill Clinton as an example, "The American public has a forgiving mind." That Gingrich practically bubbles over with passion and ideas will play especially well in the primaries and caucuses, which tend to attract "hard-core political junkies who are better educated and like ideas," says Mark Blumenthal, aka Mysterypollster, editor of pollster.com. "In New Hampshire," he adds, "if you go up with a bunch of white papers, there are going to be a lot of takers." New Mexico Gov. Bill Richardson's biggest advantage is his resume. He has decades of Washington experience, first as a staffer in the State Department and for the Senate Foreign Relations Committee, then as a eight-term U.S. representative, next, briefly, as U.S. Ambassador to the United Nations and finally as secretary of energy under President Clinton. Perhaps even more impressive, while in Congress, Richardson served as an emissary for Mr. Clinton, negotiating the release of two hostages with Saddam Hussein and a pilot from North Korea. He also has experience negotiating with Fidel Castro, Slobodan Milosevic and leaders from Nigeria, Sudan and the Taliban. He's been nominated for the Nobel Peace Prize four times. "He's got experience in the toughest international negotiations ever," says Democratic pollster Mark Mellman. "He can say 'I've gone to the table with the bad guys and won.' "
He's now a popular governor of a western state who currently chairs the Democratic Governors' Association. Most recent national polls have Richardson at 1 or 2 percent. Luntz's focus groups found Richardson to have the "perfect" resume, and most seemed to like his message. But many participants said he wasn't engaging enough as a speaker and some went so far as to call him "boring." Richardson, 59, is married and has no children. His mother is Mexican and his father is a Boston banker. Richardson lived in Mexico City until he was 13. His Latino background might also help attract Hispanic voters. But says, Blumenthal, the Latino vote is probably more of a factor in the general election. "In terms of the Democratic primary electorate, there hasn't been a significant Latino vote in Iowa or New Hampshire. Outside of Florida, the Southwest, maybe parts of New York, there aren't many places with a really large Latino base." Editor's note: Sen. Bayh announced on Dec. 16 that he will not seek the presidency in 2008, saying he believes the odds of a successful run are too great to overcome. Like Richardson, Indiana Sen. Evan Bayh comes to the race with the advantage of having both Washington and gubernatorial experience. He was a two-term Indiana governor, and has been a senator since 1998. Bayh, 50, is married with two young sons. The Indiana senator has situated himself as a centrist, stressing, according to his Web site, "fiscal responsibility, lower taxes, job creation and lean government." Bayh chaired the centrist Democratic Leadership Council for four years and is involved bipartisan efforts in Congress. But Bayh may run into trouble in the primaries for his early strong support of the Iraq war. In the fall of 2002 he pushed for adoption of the resolution that authorized President Bush to begin the war. Although he hasn't officially declared, Bayh has announced plans to form a fundraising committee and has hired campaign staff. "He has this very serious team … some very high-powered help," says Blumenthal, noting that he's worked with some of the members. He also has the credentials of being both a popular senator and former governor in a red state, and he's a Midwesterner, which may translate into appeal in Iowa." Like Richardson, Bayh still lacks name recognition and most recent polls have him between 1 and 3 percent. Luntz's focus group participants found Bayh likable, with a down-to-earth appeal, but some found him boring. The report concludes, "The theory that he's too moderate in his philosophy or tone was not borne out by what we heard. It's the moderation in his style that is his greatest challenge." Iowa Gov. Tom Vilsack recently drew a flurry of national attention by becoming the first presidential candidate to formally enter the 2008 race. As the first Democratic governor in a traditionally red state in three decades, the two-term governor seems positioned to do well in the primaries, especially the all-important first caucus in Iowa. 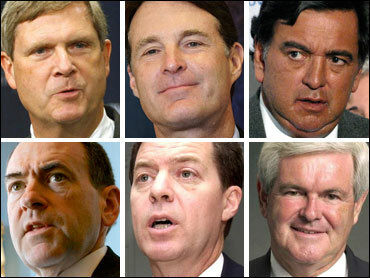 But a Des Moines Register poll taken over the summer ranked Vilsack fourth in Iowa, behind Edwards, Clinton and Kerry. Even if Vilsack does rally to win the caucus, it would be discounted as coming from his home state. As to why Vilsack did so badly in the poll, Drake University politics professor Arthur Sanders says that it's hard for a small state governors to convince anyone, even their own constituents that they're presidential material, and, "Many of the activists in the Democratic Party in Iowa have had a distant relationship with him — he's never been one of their favorites." Unlike state party darling Sen. Tom Harkin, Sanders says, Vilsack is too centrist for party activists, who tend, on a whole, to be more to the left than mainstream Democrats. Vilsack, for example, signed an (admittedly toothless) English-only law, and currently chairs the Democratic Leadership Council. And even among more mainstream Iowans, Vilsack is a governor who is liked, but not loved, says Goldford. "He is moderately popular. He has no huge fans and he has no huge enemies." National polls have Vilsack at 1 percent — when he appears at all. In Luntz's focus groups, Vilsack fell at the bottom of the field of Democratic hopefuls, even among Iowans, who liked him, but not as much as the others. He rubbed New Hampshire participants the wrong way with his repeated allusions to religion and his lack experience as anything but a "small state governor." Vilsack does have some plusses that could give him traction, once he becomes better known, says Goldford. He understands domestic policy well, perhaps to the point of being a little "policy wonkish" and radiates sincerity. "He comes across as honest and concerned and a straight-shooter," says Goldford. Vilsack, 55, who is married with two sons, also has a compelling personal story. He was orphaned when he was a few days old. He was soon adopted, but his new mother was addicted to alcohol and prescription drugs. When he was 13 his parents separated and he and his sister were raised by his father. Vilsack will probably do better in Iowa than his current polling indicates, says Sanders. "Statewide he was elected twice, and his approval ratings have always been reasonable. It'll still be easier for him (in Iowa) no matter what that poll says." Although it may appear now that none of these second-tiers will win the nomination, Iowa, Nevada and New Hampshire could change everything. Most of these candidates are polling so low largely because they're unknown, not disliked. But these first few primaries and caucuses are in small states, points out Sanders, allowing candidates to talk to lots of people directly and get their message out. And voters in these states are likely to do their best to listen, says Goldford. "I don't want to sound like I fell off the back of a turnip truck, but it really is remarkable to watch folks engage in this process. Those who show up take it very seriously." If you have doubts, agrees Blumenthal, just look back to the last presidential election. "John Edwards was nowhere in most of these national polls, but he raised enough money to run a credible campaign that Iowans responded to, and he got very popular in Iowa and nearly won. The horserace polls done at this point four years ago would have told you nothing about his potential. Nothing." And even if one of the second-tiers fails to come in first or even second in Iowa, if he can just rise out of the single digits, the momentum he gains from the jump could make a big difference. "Raw numbers don't mean anything," says Goldford. "Everyone has the same opponent, and the name is 'expected.' "
"It's one thing to look at the racing form and to pick the favorites," Goldford adds. "But there's a reason they actually run the race — because favorites don't always win."